Learn about RDBMS and the language used to access large datasets – SQL. A database is a set of data stored in a computer. This data is usually structured in a way that makes the data easily accessible. A relational database is a type of database. It uses a structure that allows us to identify and access data in relation to another piece of data in the database. Often, data in a relational database is organized into tables. Tables can have hundreds, thousands, sometimes even millions of rows of data. These rows are often called records. Tables can also have many columns of data. Columns are labeled with a descriptive name (say, age for example) and have a specific data type. For example, a column called age may have a type of INTEGER (denoting the type of data it is meant to hold). In the table above, there are three columns (name, age, and country). The name and country columns store string data types, whereas age stores integer data types. The set of columns and data types is the schema of this table. 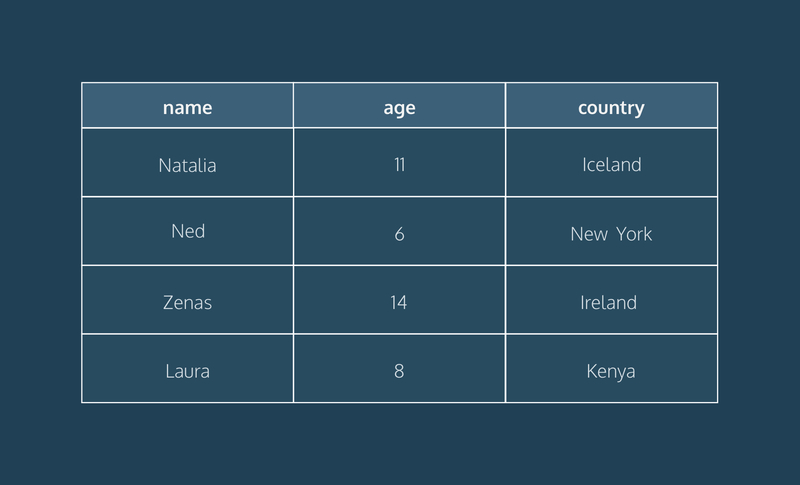 The table also has four rows, or records, in it (one each for Natalia, Ned, Zenas, and Laura). A relational database management system (RDBMS) is a program that allows you to create, update, and administer a relational database. Most relational database management systems use the SQL language to access the database. SQL (Structured Query Language) is a programming language used to communicate with data stored in a relational database management system. SQL syntax is similar to the English language, which makes it relatively easy to write, read, and interpret. Many RDBMSs use SQL (and variations of SQL) to access the data in tables. For example, SQLite is a relational database management system. SQLite contains a minimal set of SQL commands (which are the same across all RDBMSs). Other RDBMSs may use other variants. SQLite is a popular open source SQL database. It can store an entire database in a single file. One of the most significant advantages this provides is that all of the data can be stored locally without having to connect your database to a server. SQLite is a popular choice for databases in cellphones, PDAs, MP3 players, set-top boxes, and other electronic gadgets. The SQL courses on Codecademy use SQLite. MySQL is the most popular open source SQL database. It is typically used for web application development, and often accessed using PHP. The main advantages of MySQL are that it is easy to use, inexpensive, reliable (has been around since 1995) and has a large community of developers who can help answer questions. Some of the disadvantages are that it has been known to suffer from poor performance when scaling, open source development has lagged since Oracle has taken control of MySQL, and it does not include some advanced features that developers may be used to. PostgreSQL is an open-source SQL database that is not controlled by any corporation. It is typically used for web application development. PostgreSQL shares many of the same advantages of MySQL. It is easy to use, inexpensive, reliable and has a large community of developers. It also provides some additional features such as foreign key support without requiring complex configuration. The main disadvantage of PostgreSQL is that it is slower in performance than other databases such as MySQL. It is also less popular than MySQL which makes it harder to come by hosts or service providers that offer managed PostgreSQL instances. Oracle Corporation owns Oracle Database, and the code is not open sourced. Oracle DB is for large applications, particularly in the banking industry. Most of the world’s top banks run Oracle applications because Oracle offers a powerful combination of technology and comprehensive, pre-integrated business applications, including essential functionality built specifically for banks. The main disadvantage of using Oracle is that it is not free to use like its open source competitors and can be quite expensive. Microsoft owns SQL Server. Like Oracle DB, the code is close sourced. Large enterprise applications mostly use SQL Server. Microsoft offers a free entry-level version called Express but can become very expensive as you scale your application. Relational databases store data in tables. Tables can grow large and have a multitude of columns and records. Relational database management systems (RDBMSs) use SQL (and variants of SQL) to manage the data in these large tables. The RDBMS you use is your choice and depends on the complexity of your application.